Well, hello there! It’s another week on the Not Back-to-School Blog Hop. If you are hopping over, WELCOME! Be sure to hop over to the Not Back-to-School Blog Hop to check out all of the bloggers who have linked up their school rooms. We are entering our 15th year of home education. Our first year, we did use a school room. We made a trip to Orlando (a 3 hour drive) to visit the Lakeshore Learning Store. Oh, what fun I had wandering those aisles! Every school supply imaginable was on display for me to touch (and want!). We purchased a large table, 4 small school chairs, along with a plethora of “stuff” we’d need to home educate (okay, so maybe we didn’t technically need all of it). This was the trip where we had a tire blow out on I-75 on our way home. Quite memorable, eh?! So, we set up this room with a chalkboard, copy machine, file cabinet, and said table and chairs. We were ready to venture onto this journey called home education. It was nice to be able to leave projects in progress on the table. It was nice to shut the door when the room was less than tidy. But, what wasn’t nice was being stuck in that room while “life” was happening elsewhere in our home. When we first started homeschooling, it was 1997 and we had 2 children. Rebecca was 4-1/2 and Thomas had just turned 2. What it meant was that when I needed to tend to something for Thomas, I had to leave Rebecca alone in the school room. Or when it was time to start lunch or supper, she was alone. It just meant either I was neglecting something or leaving Rebecca alone. I didn’t really care for either choice. Within 2 years, we were blessed with Natalie, our third babe. We needed more room in our home. And the school room just didn’t make sense any more. So, it became a bedroom. And our kitchen table became our school room. It’s been that way ever since. This isn’t an ideal situation, but it’s what works for us. I can do most household tasks while the children complete their schoolwork and still be available to them. It also means that we have a pile of schoolbooks in our kitchen all year long. It also means that we have to pack up everything at the end of our school day. I plan to purchase some hanging file folder crates this year. This would allow all of our school books to be in the crates and, thus, more easily transported from one area to another. It would also allow us to keep all of our needed items together. I have seen many school rooms, either in person or online. I will admit to being a bit envious of some of those school rooms. We’ve never lived in a large home, so it’s simply not been possible to have a separate room for a school room. Even our “office” (and my work area) is in our bedroom. It’s not my preference for that, but it’s where there is room. We make it work somehow. Our dream would be to move to a larger home with a full basement. In this basement, we would have many “stations”….such as a crafting area, sewing area, gaming area, puzzle & board game area, and a tv area. This way, no matter what we were doing, we could all be together in the same room while doing it. Until that move happens, we are making the best of what we have! And now that you have seen my messy bookshelves, it’s time for me to get to work organizing them! Thanks for visiting. 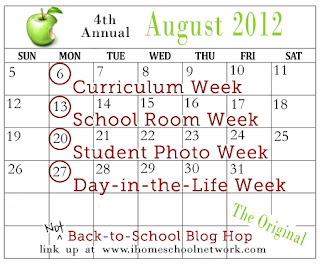 Next week on the Not Back-to-School Blog Hop, it’s the student photo week! Be sure to visit again! Don’t feel bad about your smaller house. We once lived in a 936 sq ft house, no garage, with 9 children! Our dining room was only 8×11, and yet we were able to store all of our homeschool supplies, even a small desk with a huge chalkboard, plus our dining room table and a huge bookcase in that tiny room! I am thinking about using a lazy susan idea for art supplies. While I don’t currently own any 31 items, I sure have drooled over them enough! Enjoy your new tote! We tend to do schoolwork at the table or in the living room. Or, if it’s nice outside, we’ll sit on the porch or the girls will work on the trampoline. It would just be nice to have everything in one place….though with the sheer volume of books and “stuff”, it would have to be a rather large room! Yay! Finally a schoolroom post with a space that doesn’t look perfectly neat yet contain a note apologizing for the mess. We have had years when we have a school room and years when we didn’t. Even though we might not spend much time in the school room things go much smoother when we have one! It gives us a “home” for everything. Though school itself may take place on the trampoline, on the couch, on the floor or in the school room, at the end of the day everything goes back ‘home’. Also years when our household was extremely active, a school room was critical to accomplishing anything. I needed a place we could go in and close ourselves off from everything else that was happening in our house. We make do when we don’t have one, but those years are much more stressful. I have found that not many have a dedicated school room and more of a dedicated school space. I do love the pictures of the bookshelves though! They look just like mine do.